Now that the leaves are starting to turn, it’s a good time to celebrate the new season before the winter rains move in to stay. To that end, Rainier Valley Cooperative Preschool is hosting their annual Fall Festival tomorrow, October 5 from 10 a.m.to 2 p.m. on Roberto Maestas Festival Street (next to Beacon Hill Station). Activities for the whole family include pumpkin decorating, a bike parade, a cider press, a bake sale, face painting, a photo booth, and much more. As the holiday season rapidly approaches, so does the season of many craft fairs. Blaine Memorial United Methodist Church kicks off the craft fair season with a Benefit Bazaar this Saturday, featuring food, arts and crafts, and children’s activities from 11 a.m. to 6 p.m.
Funds raised will benefit Red Bird Mission, a United Methodist Church mission to people in the Appalachian mountains. Blaine Memorial is located at 3001 24th Ave. S.
Photo by avlxyz via Flickr/Creative Commons. Want to enjoy a free-for-fall community supper with your neighbors? Then plan on meeting at the Garden House (2336 15th Ave. S.) on Friday, October 11, at 6 p.m. to enjoy what many places in America do when the leaves turn color –- gather for a harvest meal. This spring and summer the Beacon Hill Garden Club and Rockit Community Arts, with help from the Department of Neighborhoods, co-sponsored a growing project — Beacon, a Hill of Beans! — to encourage neighbors to grow some food for their plates. 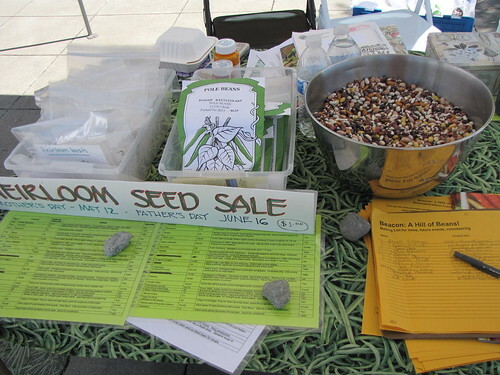 You may remember the Bean Bonanza in April, with free seeds, soil, growing advice and the bean buffet. Beanheads were seen at the Cinco de Mayo celebration, and at the Beacon Hill Festival giving away seeds (where we learned the mayor is a beanhead and promised to plant our seeds). 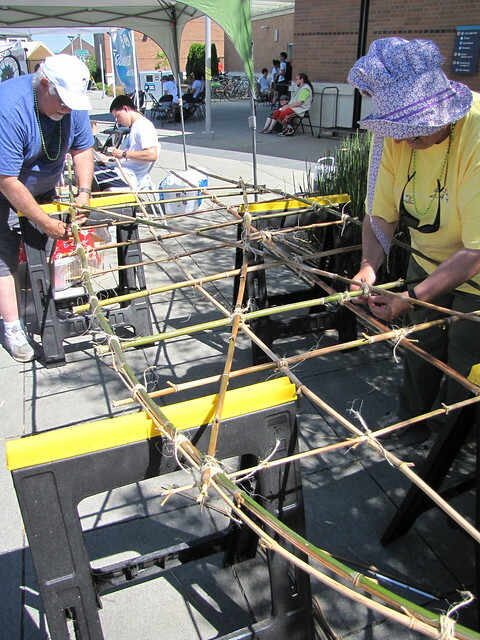 We made bean necklaces and constructed bean trellises of Beacon Hill bamboo at the June Beacon Rocks. Then there appeared the installation of demonstration gardens at El Centro (24 planters of heirloom beans) and the Jefferson Community Center (the awesome Beanhenge). Not content with single site bean fun, they then bedecked Beacon Ave storefronts into a Boulevard of Beans with pots of scarlet runners. Neighbors were seen marching around with bean-baggies, to harvest a side for dinner. The Wall of Beans at the Station coffeehouse delighted local hummingbirds—almost an excess of color and nectar! Now it’s time for the Beanheads to close out the project, celebrate our teamwork and thank the neighbors for their support of our project (hundreds of hours of community work). Please come have supper with us! 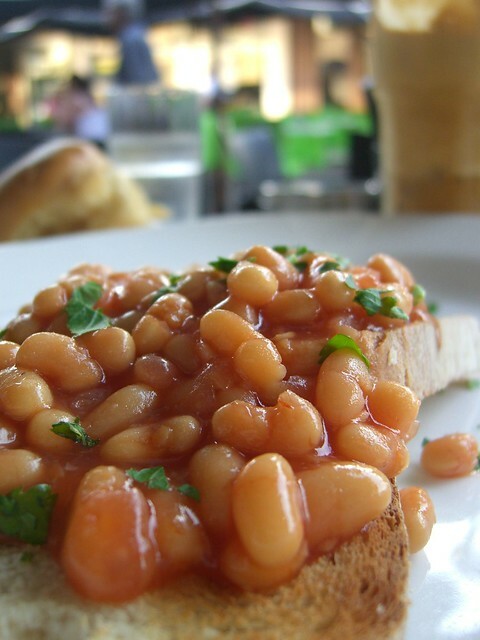 We’ll have some delicious world bean dishes, salad, cornbread and dessert. 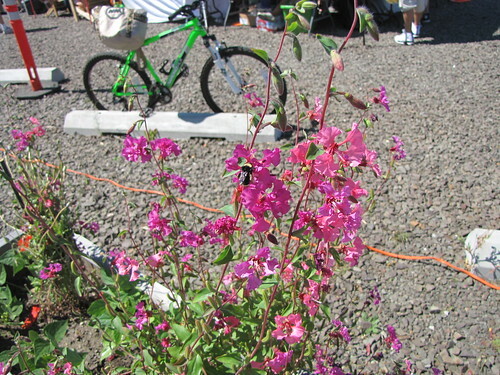 There will be seeds to share and swap (not all beans, but plenty of them) and we’ll play some rousing rounds of bingo. Unfortunately Bean-o has declined sponsorship of this event, but we feel “propelled” to carry on. 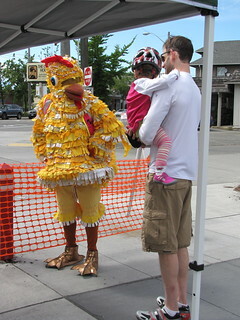 Neighbors enjoyed last year’s Jefferson Park Jubilee. Photo by Wendi Dunlap/Beacon Hill Blog. Summer may be drawing to an end (don’t remind me! 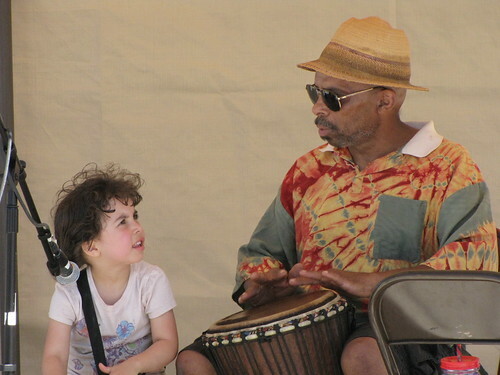 ), but summer fun still awaits in Jefferson Park on Saturday, September 14, when the Jefferson Park Jubilee sets up in the park for a day of music, art, food, film and fun celebrating the recently rebuilt park. 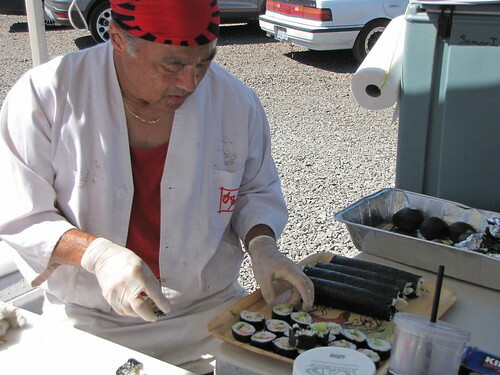 From 1-7 p.m., the Jubilee will feature food and craft vendors, traditional park games to recreate historical Japanese picnics that used to be held there, tours of the Beacon Food Forest, performances, and more. From 7-10 p.m. is the summer’s final outdoor movie, Raiders of the Lost Ark. See the event schedule here. The park is located on Beacon Avenue, just south of South Spokane Street. Parking near the event may be scarce, so alternate transportation is recommended. For more information, contact info@beaconhillmerchants.com. 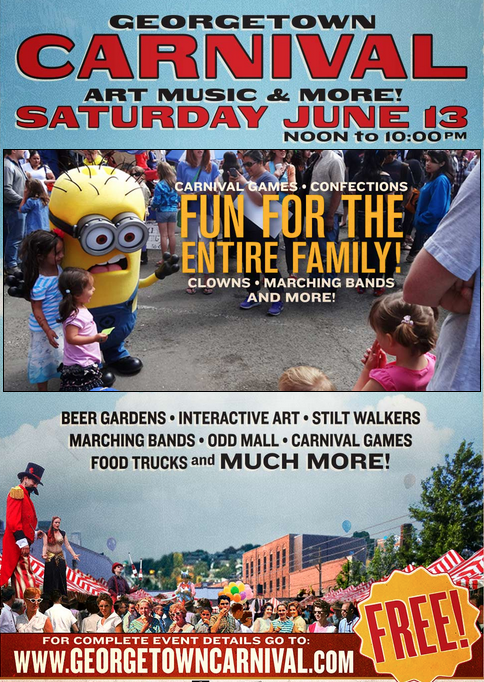 There will be a flea market, kids’ wading pools, and the usual entertainment from local performers. Youth from the Duwamish Tribe will share Duwamish River clean up information along with info about current efforts for Federal recognition of the tribe. Break dancing by “Catch ‘Em All” during every set break! Beacon Rocks! 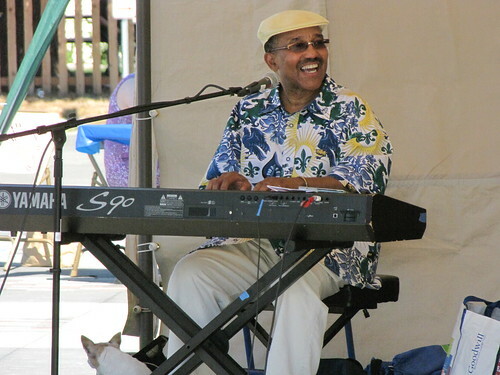 today from 1-5 p.m.
Mr. K (Kent Stevenson) performed at the June 2013 Beacon Rocks! event. Photo by Wendi Dunlap. Along with four hours of local music, other activities will include making and decorating your own hula hoop, and building a paper boat to sail in the wading pools. 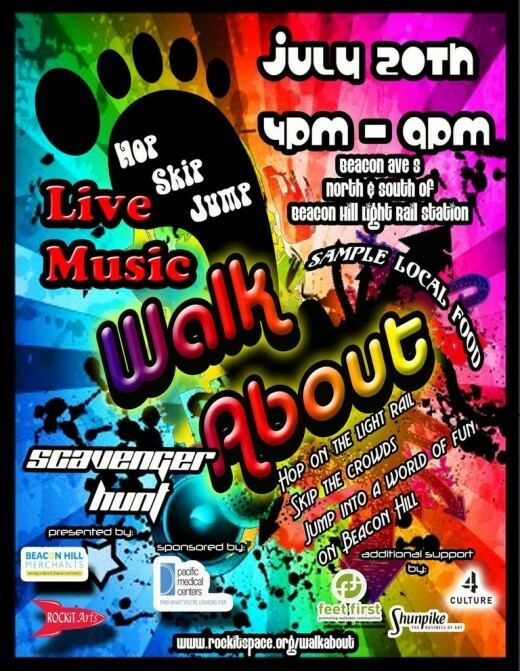 The Beacon Hill Merchants Association presents a special treat for this coming Saturday, July 20th: A “Walk About” and Scavenger Hunt at Beacon Hill Station and Stevens Place Park (the park commonly known as “Triangle Park” at Beacon Avenue South and South Stevens Street). The Stevens Place Park info booth for the event will sell four different “Walk About” collectible buttons featuring local artists. The buttons are also good for that-day-only bargains at local shops. 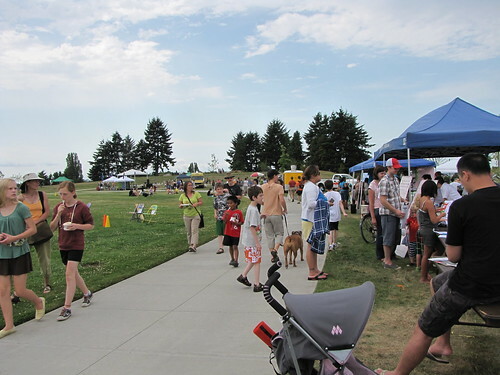 A “Taste Of Beacon,” starting at 4:30 p.m. at the park, features a piñata at 5:30, plus samples of food and drink from the following Beacon Hill restaurants: Traveler’s Thali House, Baja Bistro, Inay’s, La Cabaña, El Sabroso, Beacon Avenue Sandwiches, Victrola Espresso, Despi Delite Bakery, and Golden Daisy. Free entertainment on your way all along Beacon Avenue starts at 4 p.m. and includes: The Adam Hicks Trio at the Station; DJ WD4D, DJ Shorthand, Culture Shakti, and Naira Kai at Hanford Mural Stage; a community art project at 15th and Beacon; DJ Joel Mercado, Gosona, and Dansing Lolos at the El Quetzal/Victrola stage; and an ongoing letterpress printing demonstration at Day Moon Press. The Scavenger Hunt can be played one of two ways. Register at Stevens Place Park or at Beacon Hill Station starting at 4 p.m. The smartphone version uses the Munzee app to play. The competition runs between 4 and 8:45 pm. The top three hunters of Munzee sites will receive trophies. Those desiring an old-fashioned scavenger hunt may register, then follow a map and clues, to pick up twenty items at participating “Walk About” businesses. The fastest person to collect all twenty wins a trophy. For more information on this all-ages event, see the website. The weather was warm (very warm) and sunny for this year’s first Beacon Rocks! event, with the theme “Beacon: A Hill of Beans!” Here are a few photos from the event. All photos are by Wendi Dunlap. 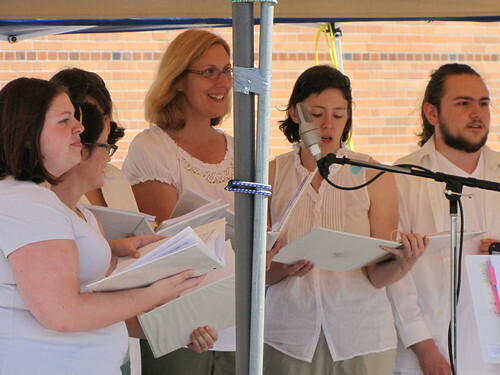 This Sunday, June 30, it’s “back to the bean” on Beacon Hill for this summer’s first Beacon Rocks! 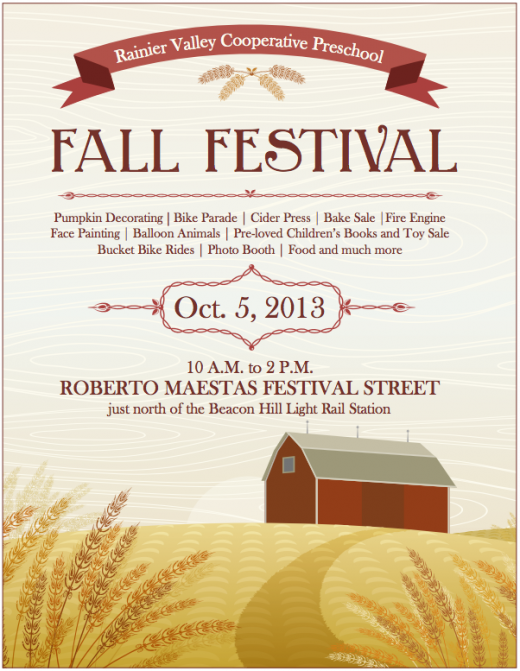 event at Roberto Maestas Festival Street from 1 to 5 p.m. As in previous summers, Beacon Rocks! 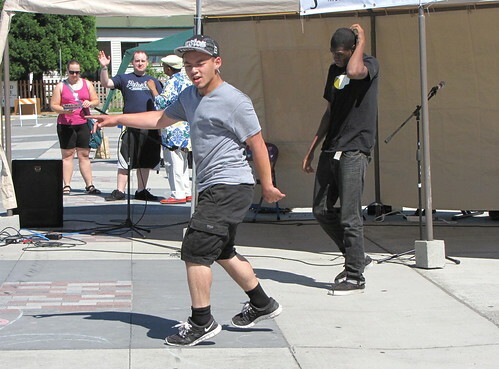 is a free, all-ages street fair with music, dance, and vendors. This week’s theme is “Beacon: A Hill of Beans,” a celebration of growing, eating and sharing beans as part of this year’s ongoing Hill of Beans project. Other activities include a bean bag toss for prizes, a haiku contest, making bean necklaces, and more. This year, a new addition to the event is a flea market. For $25, you can rent a six-foot space to sell or trade your stuff. Find the application here.